When the American clipper ship "The Queen" is attacked by pirates off the Hebrides in 1830, Mate Kirk Hamilton is injured and must be put ashore at Queensland Colony, Australia, for treatment and recuperation. There, he meets and falls in love with Elaine Jeffries, daughter of the magistrate and all-but-fiancée to rancher Martin Shannon. She also finds herself attracted to Kirk, and a rivalry develops between the two men. Meantime the pirates, led by Captain Hackett, decide to raid the colony and, in the process kidnap Elaine and her friend. Nancy. Kirk, and Shannon lead the pursuit, having not only the romantic triangle to resolve, but the pirates to overcome and, along the way, being stranded on a volcanic island inhabited by dinosaurs. 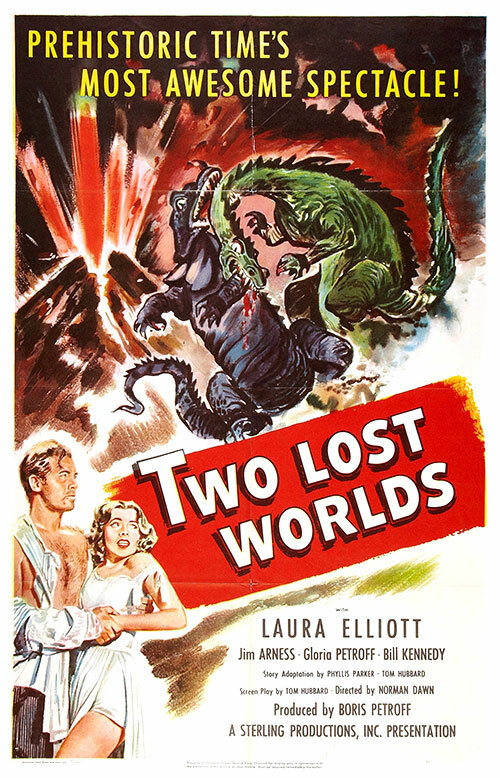 0 Response to "Two Lost Worlds (1951) Norman Dawn "